“Kama Manzi Yako Anakaaa Roysambu near TRM,Pole Bro,Namkula Raw Saa Hii”,See What Happened Next! Shocking incident happened over the weekend when one lady cheated her boyfriend that she has travelled to the village.Her boyfriend was also convinced so.But few hours later the unthinkable happened,the girl,who lives in Roysambu,had invited a stranger to her house and decided to open the server,only for the man to expose her. 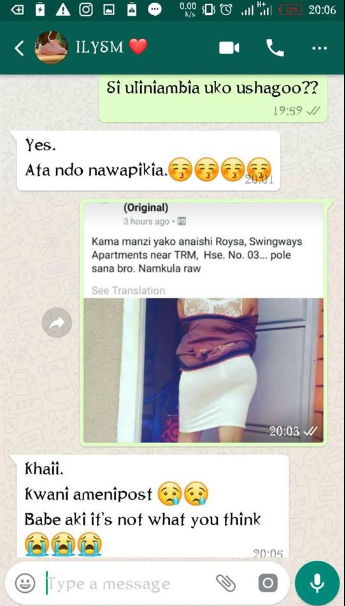 “Kama Manzi yako anaishi Roysa,Swingways,pole bro,namkula raw”.The man went ahead to prove that indeed he is chewing the lady,he posted a picture of the girl.